After the Charles Bridge, Prague Castle, and the Astronomical Clock, Týn Church (properly known as the Church of Our Lady before Týn is perhaps historic Prague’s most familiar landmark, featuring on countless postcards and tourist literature. The most important Gothic church in the Old Town, Týn church boasts two spiky towers of uneven width that soar above the buildings huddled around it. The church was established in the 14th century under Emperor Charles IV and is a symbol of Czech pride. It was a Hussite place of worship, and the only Hussite king of Bohemia, George of Poděbrady, had a giant chalice place on the gable. After the Battle of White Mountain in 1620, when the Protestants were defeated, the chalice was melted down and the church was Catholicised. 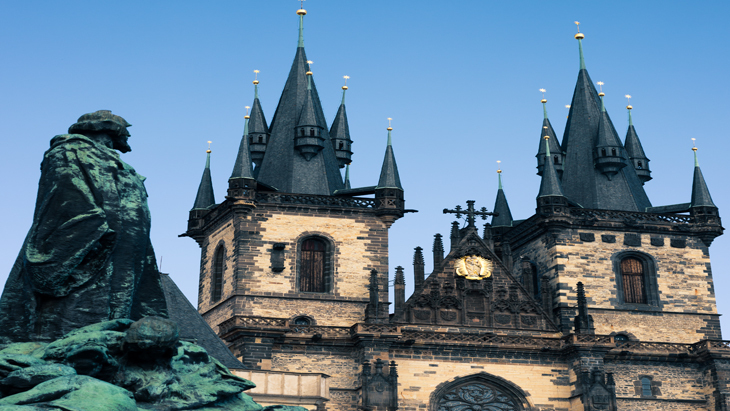 Although Týn Church is a very visible landmark, the entrance is not easy to find. Access is at the end of a short passage leading from an arcade running along the eastern side of Old Town Square. To see the superb Gothic north portal, bears the hallmarks of architect Petr Parléř’s workshop, leave the building and turn right into Týnská ulice. The church has been restored recently, making the lofty Gothic interior seem taller. Some Gothic furnishings survive, including a 15th-century baldachin. Other items include Baroque black and gold altarpieces, which contrast with the white walls. Týn Church is also the burial place of Tycho Brahe, the famous Danish astronomer who worked at the court of Habsburg Emperor Rudolf II. The red marble tomb is in a pillar to the right of the chancel steps.